US forces have attacked the Syrian military, reporting over a hundred deaths.The Syrian Ministry of Foreign Affairs is calling the air strike a massacre, a war crime, and a crime against humanity. It’s a bit like saying you broke into someone’s house and strangled them from behind with a garotte in self-defense. Believe it or not, it appears very likely that the US military’s latest act of butchery waged upon Middle Easterners on their own land was not about self-defense at all, but about oil. The always insightful Moon of Alabama makes a compelling case that not only is America’s version of events full of plot holes, but that the whole thing could very well have been “a trap” to sabotage a local deal that had been made for the SDF to turn over an oil and gas field to the Syrian government in the near future. 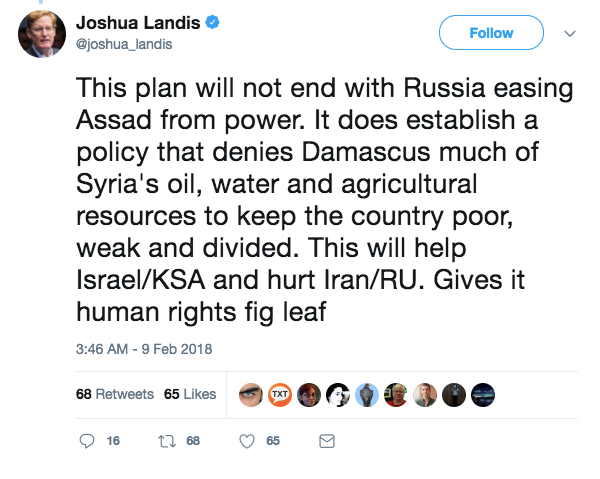 This would fit in perfectly with comments Professor Joshua Landis made about the attack, saying that America’s plan is to keep Syria weak, poor and divided in order to disadvantage US/Israel/Saudi rivals Iran and Russia. It would also clarify US Secretary of State Rex Tillerson’s assertion a few weeks ago that thousands of American troops are being kept in Syria to prevent Assad from regaining control of areas that have been liberated from ISIS. This is what the new imperialism looks like. When the Russian Federation annexed Crimea in 2014, everyone lost their minds. Countries don’t just annex territory from other countries anymore! It’s so barbaric! It’s so… 20th century. That’s simply not how we do things in the modern world. We don’t expand our geopolitical power by blatant land grabs: we expand it with treaties, alliances, intelligence/surveillance deals, trade agreements, corporate contracts, secret pacts, and occupations of key strategic locations under the pretense of fighting terrorism. Like civilized people. In the old days, an empire would expand itself by invading a weaker territory, killing its people until they gave up, and planting its flag there. We’d change the maps so that everyone could see that the region was now under the control of Rome or the British Crown or Napoleon or whomever, and the power structures would align themselves accordingly. It was all relatively simple and transparent. The new imperialism doesn’t do that. You will never see Syria made into the 51st state. Since the end of the second World War it has been increasingly taboo for a government to overtly invade a country and add it to that government’s official territory, and many international laws were locked into place to reflect that. And yet world power has arguably never been more consolidated than it is right now. The US, the UK, the EU, Saudi Arabia, Israel, Canada, Australia and many other nations tend to march more or less in lockstep with one another on a vast array of subjects ranging from neoliberalism to surveillance to which “regime” is in need of more crushing sanctions on a given day. The alignment isn’t perfect, but it’s too close to perfect to deny. Here in Australia we joke about being America’s 51st state, but, like Syria, we never will be. We don’t need to be. We’re already answerable to the same corporatist powers which control the US, so we trot right along into every US war, every US trade deal, and operate as a US intelligence asset just the same as we would if they’d planted the stars and stripes on our capitol buildings and called us Wisconsota. Through military alliance, intelligence alliance, corporatist agreements, and a good old-fashioned coup staged by the CIA and MI6, we transitioned smoothly from subservience under the old form of imperialism to subservience under the new. A whole continent full of McDonald’s-eating sheep. In the new imperialism, countries keep their borders, keep their names, and on paper keep their own sovereign governments as well. Australia remains Australia, Syria remains Syria. But the power dynamics are all bent to funnel toward the favor of the same vast power conglomerate. So they’re content to control a few strategic locations in Syria to wage a disruption campaign against rivals of the empire. They don’t need to annex Syria in order to do that, or even oust Assad. They’re not interested in the country, they’re interested in the nonlocalized new empire. They’ll control a few oil fields, secure a few shady alliances, unleash a few terrorist armies, all to funnel more and more power into the new empire, one contract at a time. Corporations and banks are not limited by national borders, and neither are the oligarchs who own them. Nations and governments don’t exist anymore. Not in the sense that they used to, anyway. The notion of meaningfully separate, sovereign governments is at this time a fairy tale told to the masses to keep us from realizing that we’re all being thrown into the gears of an exploitative threshing machine that only exists to feed the avaricious agendas of a few ruling elites. This has all been made possible by an ongoing war on the societal concept of sovereignty. Our concept of sovereignty is now so weakened that a powerful government can get away with invading another country and claiming “self defense” when it kills the people there, so weakened that constant domestic surveillance by secretive and unaccountable intelligence agencies is now considered normal, so weakened that the public will ferociously defend a police officer that guns down a civilian who reached for his wallet a little too fast. If society found some way to restore sovereignty to nations, governments, and above all to human beings, the ecocidal, omnicidal new empire which depends upon blurred lines and ignored boundaries would be unable to survive. And that would be great, in my opinion.